. . . our two biggest sites are cleared, but the rest of the sites are working on a 5 posts/day deal, so long as those aren’t written by international bloggers, but only US writers. Anything above and beyond that is unpaid and will be written under a staff account. Nearly everyone has agreed to post for free, including columnists, in the hopes that we will all still have jobs come August 1, when they’re telling us we’ll be back — just on a smaller budget. Now it looks like some of those bloggers are going unpaid, and are writing under those staff accounts. 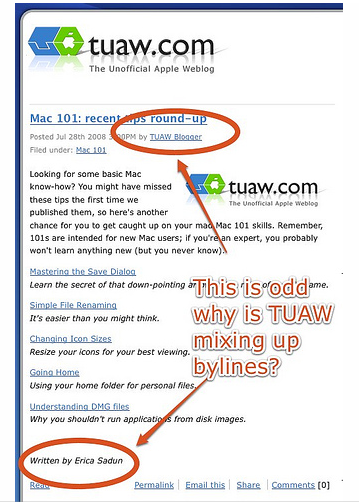 On The Unoffical Apple Weblog (TUAW), for instance, some posts such as this one (screen shot at left) show an odd double byline, with the linked byline being attributed to a “TUAW Blogger” and the actual blogger’s name in text at the bottom. Apparently, the way AOL’s accounting system works, bloggers only get paid if their name is in the linked byline. It may be hard to prove that such “off-the-clock” work is illegal, especially in an environment where many people write for free, but there’s no question that it crosses an ethical boundary. AOL has no business asking bloggers to participate in what amounts to slave labor in return for a chance at keeping their jobs come Friday. Update: We spoke with Victor Agreda, Jr., Programming Manager of AOL-owned Weblogs Inc. (which owns TUAW) about the situation. He says that all Weblogs authors are going to be paid, and that Erica Sadun (the author of the post mentioned) likely chose to use the generic TUAW Blogger alias for personal reasons. He says that other authors writing under the same alias are being paid their normal flat fee. Mr. Agreda was unable to comment on the payment status of other blogs owned by AOL that don’t fall under the Weblogs brand. Update 2: Peter Kafka at Silicon Alley Insider confirms that some AOL bloggers indeed are working for free (on their own accord). But what choice do they have, really? Stop blogging and their traffic will die. (Screen capture courtesy of Jason Calacanis).